A dog with a horribly maimed face was found near a park in Pittsburgh. The pit bull, dubbed Bruce, is recuperating from his injuries at Humane Animal Rescue. 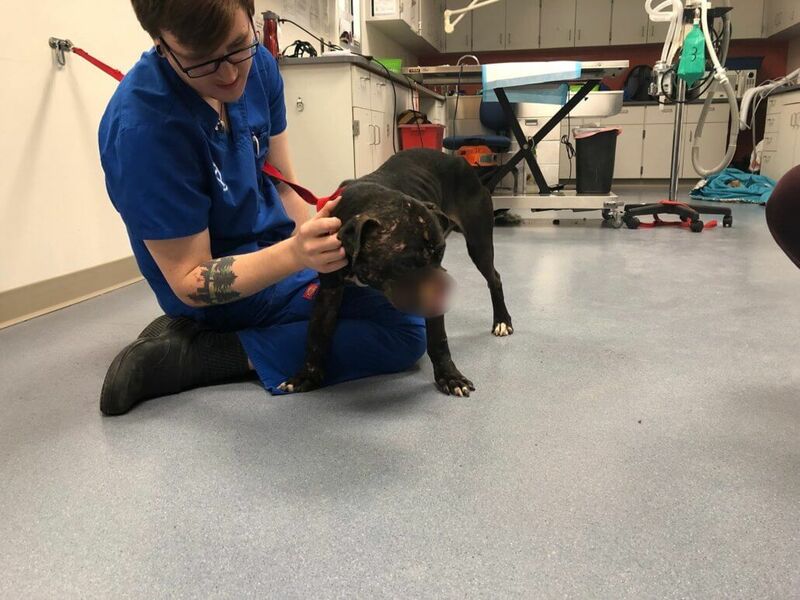 City of Pittsburgh Animal Care and Control officers responded to an emergency call to pick up a stray dog in McGonigle Park early this afternoon. Upon arrival, the officers noted that the dog was severely injured on its muzzle and missing skin from its face. Bruce is estimated to be under two years of age. Once he was sedated, the veterinary staff assessed and cleaned his wounds, provided IV fluids and placed him on a heating blanket to raise his body temperature to a normal range. Bruce’s body is covered in scars, lacerations and puncture wounds and his face has been degloved – he will require extensive veterinary care. Bruce’s face has been so badly injured that his overall quality of life is in question reports WTAE News. Donations can be made on Bruce’s behalf here. Donations for dear sweet Bruce can also be made to the Pittsburgh Animal Care and Assistance Fund. Sounds like a victim of dog fighting. Everybody needs to be on the lookout and if they see something, SAY SOMETHING! You could save a life! This poor precious baby has obviously been used as a bait dog. My Thoughts and Prayers for Bruce are that he WILL fully heal and fully recover both physically and mentally from the horrific trauma he is suffering from, and that he will, given time, find his ideal furever family who will just spoil him with love every day for the rest of his life. I also pray that the perpetrators of this heinous crime will be identified, located and meet with the inside of the justice system for a very long time.